Fairfax Theatre Company (FTC) is a grass roots, non-profit community theatre company that evolved from the former Fairfax Players. Since we were established in 2008 we have produced first rate entertainment for the community—everything from Shakespeare to original musicals. We draw on the wealth of talent in our town and represent all age groups within the performing arts. We are well on our way to creating a permanent repertory company of dedicated artistes and crew, who not only produces original plays that appeals to the greater Fairfax community but also encourages beginning and established playwrights, producers, directors, and performers to participate in our ongoing mission to further the performing arts in our town. Within this, we have created a Youth Theatre Program in which the young people of Fairfax are encouraged to write, produce, direct and participate in all aspects of theatre production. Further, we are working to create a Science Theatre Program that will set out to produce ‘Science Based’ plays to encourage interest in Science and Math through the performing arts. Another goal toward serving the community is to acquire a venue that will be used for a wide range of activities: musical performances, guest speakers, poetry readings, workshops and master classes in writing for the stage, costume and set design, stage lighting and sound, how to write music for the theatre and instruction in stage combat, juggling, mime and improvisation. 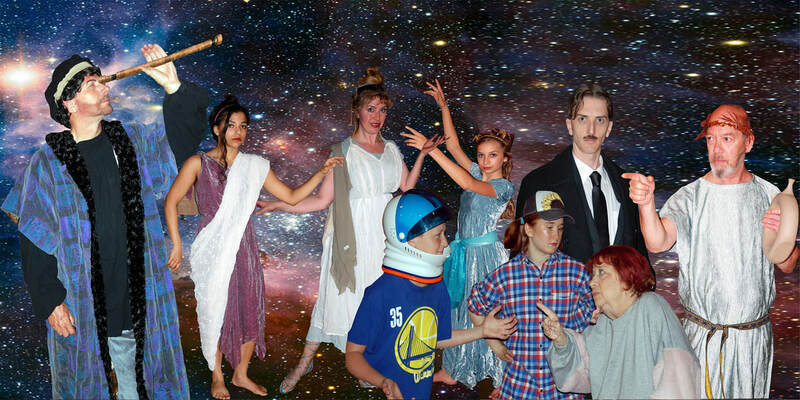 “Cosmos, Planet Home!” an original, galactic extravaganza for people of all ages! Our most recent production ran from June 29th-July 21, 2018 - we hope you can join us next summer and enjoy our annual performance! Ever wonder about the cosmos? You’re not alone. Find out about our wonder of the universe at “Cosmos — Planet Home!” Fairfax Theatre Company’s latest original production — written by founder Sam M. Parry — uses special effects, sound, dance and music to help us understand the cosmos in philosophical, spiritual and scientific terms.